Experience pure nature in a bungalow near the lake! 70,00 Euro / night for 5 pers. Bungalow in the nature reserve, 150m to the lake! In the big city, the tram quivers, with us only the Kickelhahn crowing! 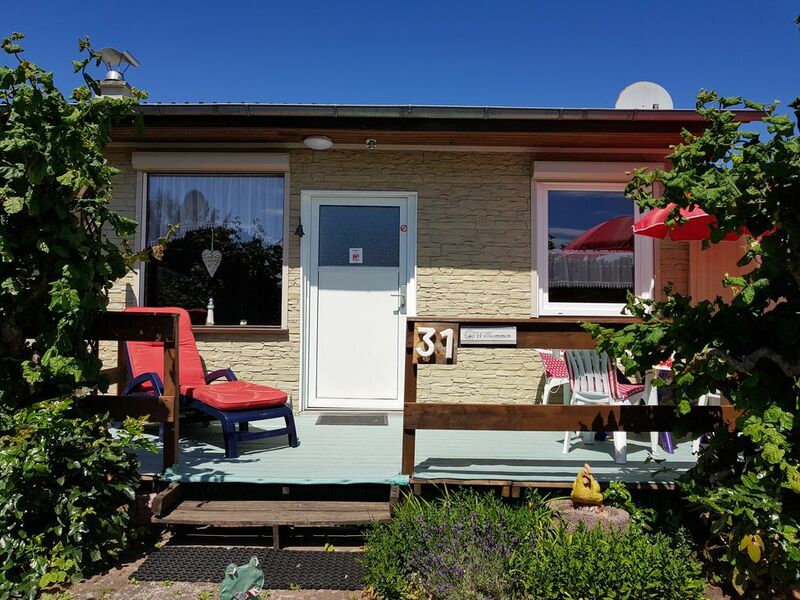 The holiday home "Casa Dira" in the Mecklenburg Lake District in Schwarz is located just 150 meters from the Black Lake, with a small swimming area and boat dock. It is located in a quiet cottage area. Here you can soak up the sun, swim, swim, fish, go boating or enjoy nature by bike with your multitude of excursion destinations. a living room with couch and a fireplace for the cool days. Two terraces are waiting for you - one in front of the south facing bungalow to sunbathe and relax and a second terrace behind the bungalow, which offers through its roof the opportunity to sit under shady trees even in bad weather or high heat or the "cigarette" along To enjoy coffee in the dry! For our little guests there is a high chair and various toys! Your car is protected from the sun in the adjacent carport! You can bring your own boat and dock at our boat dock or rent a boat on site! Experience the beautiful Mecklenburger Kleinseenplatte with the cities Waren / Müritz, Röbel and Rechlin, stroll through the beautiful cities or enjoy the tranquility on the water! "In the big city squeaks the tram, with us only the crows Kickelhahn." ..... That's our motto for your holidays in the quiet village on the southern Black Müritz! For our Black Sea applies motor prohibition for all watercraft, except electric motors. Thus, our guests can expect clear water and a calm sea! Horseback riding can be found in the village and in the neighboring towns of Canow and Zempow. For your physical well-being there is a restaurant on the lake and at a bathing place in the place also a kiosk! Since 2016 Schwarz has his own doctor's office!